David comes home with his 600 followers, [he’s not really sure where he fits as far as his countrymen go but he still is clear on his relationship with his God] only to find all the wives, children and possessions taken and the city burnt down. The Bible says that when David and his men realised what had happened, ‘They wept until they could weep no more’. So David asked God what to do, “Should I chase after this band of raiders? Will I catch them?” God said, “Go! Fight! Recover what your enemy has taken!” But 200 of David’s men were so exhausted from mourning that they could not go and fight for their wives, children and possessions. They had no energy left to fight the battle God had for them and worse still, the remaining 400 of David’s men had to do the work that 600 should have done. Thank God for His mighty provision! However the tired 200 missed out on fighting the battle. They missed out on fighting for their families. How often do we in the church put our energy into fighting the wrong battle? Sadly, we are fighting to hold onto offences, bitterness or hurts from people inside the church, fighting for a ministry God wants to close in order for something to supersede it or perhaps fighting for our own reputation. Are these the battles God has in store for us? Usually the battles God has for us are scary and God-sized, but He wants us involved. He wants us to fight for our families and friends. He wants us to recover everything that was taken from us and more – to make ground! When I look at my belly these days I see the marks of an experience or period of my life that has shaped my world at this moment. The single woman may look at her list of achievements and career climbing opportunities. For me these career steps or motherly stretchmarks have a sense of accomplishment attached, “I did something that I was made to do! I achieved and fulfilled the scripture to ‘be fruitful and multiply’.” Some part of me looks at these stretchmarks or the career achievements and I pat myself on the back, “I have truly lived.” I have something really powerful to devote my time, efforts, affection, money and service to –‘motherhood’ or ‘my job’. To truly be a good Christian woman I am to place all of my affection into being a good mother or a career climber. (Sound of cassette tape chews up)…. Standing before the great King, my body and career trophies showed nothing of true real stretchmarks. What He saw was a distant daughter who chose to save her life and now had lost everything including a life of intimacy with Him. Welcome to The Boot! We have chosen the above image of a boot, but also a heel. The heel represents being God’s princess, knowing we are loved and beautiful. 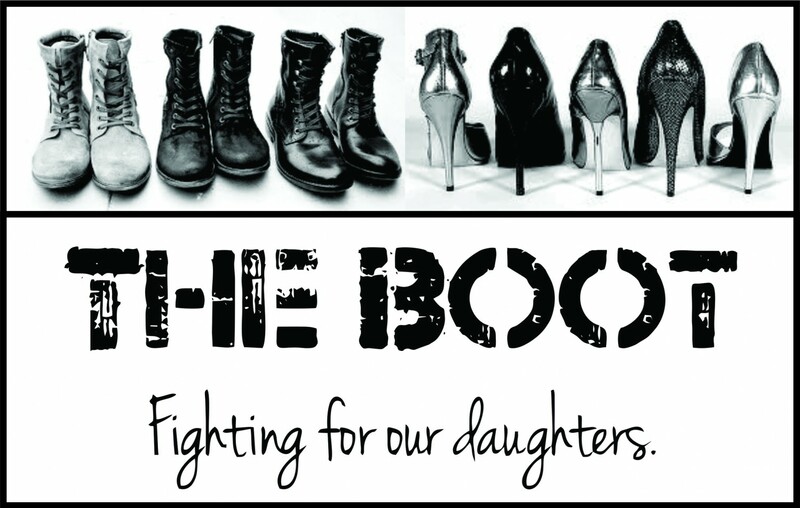 The boot represents the fact that Christians are called to be in battle, to push back powers of darkness, to make a difference in this world. As women, it can be easier to focus on wearing two heels; just being in God’s presence and secure in His love for us. But we can’t remain in this place or we could be in danger of turning into a religious fossil. In fact the more we are in love with Jesus and know His love for us, the more we should want to put on our boot and engage in the battle. It’s not a matter of heels or boots, it is both. To run into battle without knowing we are loved by the Father produces a people-pleasing, ‘serve to earn brownie points and feel good’ mentality. It has been said of William Wilberforce that he had a deep intimate relationship with His heavenly Father that empowered him to stand and fight a 40 year battle. Go walk in both shoes for His kingdom in our city.